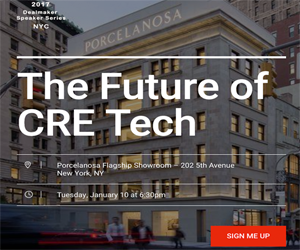 The long overdue commercial real estate tech adoption is occurring at a rapid pace. Back in January, we make a few predictions about upcoming real estate tech industry trends. Now that the temperatures the dog days of summer are here, how have the trends developed thus far? Try to accomplish work in the CRE industry without touching the cloud. It’s hard. Nearly all the big players in leasing, transaction, and property management offered cloud-based services long before January 1. CRM Apto, property manager Yardi, and asset management platform VTS use the cloud. CRE accounting and automation provider CommissionTrac is a cloud-based application that captures deal data and transaction details. Cloud-based services are more of a necessity than a trend. In our 2017 predictions, we discussed on how big data is transforming the industry by crunching real-time numbers and transforming them into easily digestible results. Big data applies to every aspect of the CRE industry. In the last six months, we’ve seen Digsy.AI use data to prove which best practices work to close deals. ReCity, a real estate analytics company, crunched the numbers and released a future trends report on the Washington, D.C. real estate market. They’ll be expanding their data-driven insights to other major markets during 2017. Expect more insights into CRE as we become better at aggregating and translating data. Ask Alexa: the Internet of Things continues to create big news, starting with January’s CES2017 where we saw everything from smart refrigerators to robotics. We predicted sensor tech to be a selling point for commercial properties. We still stand by smart tech’s selling potential in the CRE market. IOTAS agrees, and the company has designed a smart home experience for the multifamily space. Their integrated system helps property managers rent properties faster, control empty units, and reduce operating costs. We’ll be talking about smart building technology well into next year. We hit a crucial tipping point this year: more users accessed the Internet on mobile devices over desktop devices. The mobile takeover has long been coming. New CRE service providers need mobile apps to meet industry needs. Since January 1, Apto released a mobile app for CRE brokers. Startup Tenant Tracker is designing a mobile experience to simplify tenant coordination for commercial real estate projects. Another new mobile first application is Vire. Property inspectors use the app to capture every detail about the space. The professionals in the CRE field work on location more than in the office, so access anywhere at any time is essential. Quite a bit has happened in the virtual reality world since the New Year. We predicted virtual reality and immersive augmented reality would move to become more accessible in the CRE industry. So far, that's held pretty true. Facebook has gone virtual with the launch of its Facebook 360 and Spaces app. Matterport and Google partnered to offer more immersive experiences through its Google Street View application. VirtualAPT found a way to make crafting virtual tours easier using robotics. Summary: more accessible VR and AR experiences are still trending. One major trend that we should have hit on but somehow missed: artificial intelligence. We’ve been writing quite a bit about chatbots and other ways artificial intelligence is helping the CRE industry. Artificial intelligence and big data tend to go hand-in-hand, as the smart computing is useful in crunching the numbers, but AI is being applied to help CRE agents find leads and organize their schedule. Expect a larger impact from AI in the near future.